Blue Team in the Composer's Abyss. The Composer's Abyss is an underground structure on Halo Installation 03 used to store victims digitized by the Composer. Located at the end of the tunnel is a slipspace portal that leads to the Composer's Forge. In late 2554 the Composer was removed from Installation 03 and taken to the nearby Ivanoff Station for research by the Office of Naval Intelligence. Sometime after the New Phoenix Incident, monitor 859 Static Carillon attempted to contact Installation 03's monitor, 049 Abject Testament. When a portal opened from Static Carillon's world, leading to the Composer's Abyss, the monitor entered it to investigate Abject Testament's silence. 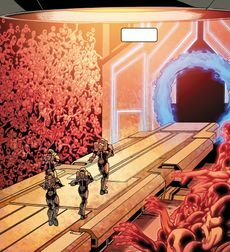 Upon exiting the Abyss, Static Carillon encountered the Ur-Didact, who demanded for the monitor to show him the Abyss' portal. On July 25, 2557, Spartan Black Team was killed outside the tunnel by the Ur-Didact and his Promethean Knights and Crawlers. Spartan Blue Team, led by John-117, was shortly dispatched to the installation, only to learn of Black Team's demise, and soon came across the Composer's Abyss. As they walked down the path inside the tunnel the Spartans discovered composed human essences affixed to the walls of the tunnel, and eventually came across the slipspace portal. The Didact was soon notified by a monitor that the Spartans had found the portal. Upon entering the slipspace portal, they were teleported to the Didact's world. After engaging the Didact and his Promethean forces at the Composer's Forge (over which Gamma Halo was relocated during the battle), Blue Team returned through the slipspace portal and re-entered the Abyss, while Static Carillon (who had turned on the Didact after the latter broke an agreement between them) attempted to close the portal behind them. Blue Team made their way through the Composer's Abyss, where they realized that the Didact was moving a Composer into position over the Abyss. When the Spartans exited the Abyss, the Didact attacked them and, after losing his right eye to the Master Chief's combat knife, attempted to kill him once and for all by crushing his head. However, the rest of Blue Team intervened, forcing the Didact to throw John aside. The Forerunner quickly subdued all four Spartans, but Static Carillon arrived and teleported the Didact away to the control room of the installation before he could finish them off. After the quick fight, Blue Team left the Abyss. The Composer's Abyss was originally going to appear onboard the Didact's ship, Mantle's Approach, in the Halo 4 level Midnight. Players would have glimpsed how composed "souls" were placed inside the bodies of Promethean Knights. Due to time, budget, and space restrictions in the level, the Abyss was cut from the game. The entrance to the Abyss. Blue Team traveling through the tunnel.